Plastic Templates - WRIGHTS-Plastic Templates. 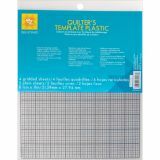 Great for designing reusable template shapes and stencils for quilting, applique and many crafts! Trace shapes onto template plastic with permanent marker. Cuts easily with scissors, art knife or rotary cutter. This package contains four 8-1/2x11 inch gridded sheets, two 8-1/2x11 inch plain sheets. Made in USA.